Along with a handful of birthday greetings in my in-box today, was this inviting gem of an email, reminding me that “Lobster is back for a limited time.” Nevermind that I asked to be removed from their mailing list seven years ago. In their defense, the terms do say “Please allow 10 days as noted in the CAN-SPAM Law for Quiznos� to remove you from all future email advertisements.” Maybe it’s just taking longer than usual because of global warming or the recession or changing gun control laws. Nevermind that my husband has a lobster allergy, so we never eat it at home. Nevermind that I don’t even eat lobster at RED LOBSTER (although I did enjoy a pre-Prom dinner there), due to the fact that I go into sodium chloride shock each time we take part of their salty cheddar bay biscuits. In fact, it’s been so long since I partook of lobster, that I have no idea what it tastes like. No clue. But I can tell you that Quizno’s wouldn’t be my go-to place. Oh, heck, no. I would have warm lobster with butter sauce, not a mish-mash of mayo. 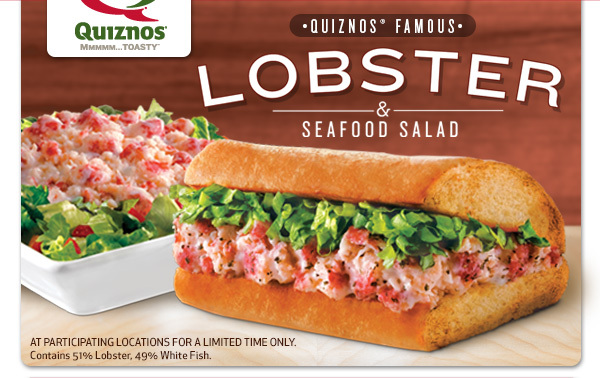 And BTW, the bottom of the ad says it’s only 51% lobster. Why not 50%? So they could legitimately say the MAJORITY of it is lobster, by a percent? I suspect it’s like the “krab” at Subway, devoid of any “crab” at all. 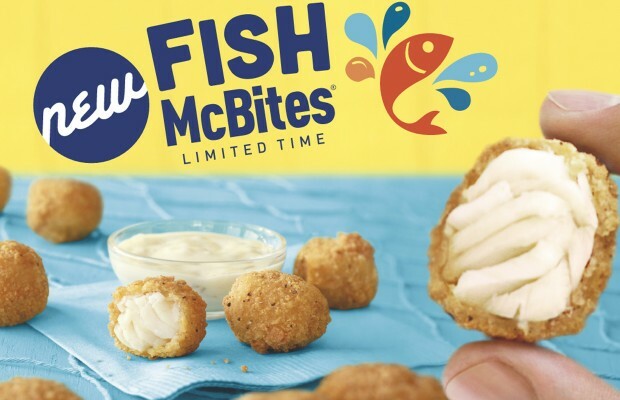 Perhaps it’s even better than McDonald’s latest treat, fish bites. Now, McDonald’s claims that these fried balls are made of tender, flaky wild-caught Alaskan Pollock. Isn’t this the same company whose jingle began, “Two ALL BEEF patties, special sauce…,” and then it turned out that the Big Mac was really just pink slime, and not so much of the all beef? Maybe if I ever get up to Maine one day (or north of Dallas), I’ll stop inside some fisherman’s wharf where Rachael Ray once spent $20 on a po’ boy that made her giddy, and taste an authentic lobster dish. Until then, Quizno’s, I’ll pass on your former slogan: Eat Up. it’s that good, isn’t it? Oh yeahhhh. I’m originally from Ct. where lobster actually has taste. Down here in FL. they give you a cloned lobster and label it “Fresh.” No comparision!